Take your team all the way in Madden NFL 17 and put yourself at the center of your team's Championship run in the deepest Franchise mode to-date. Driven by the most balanced gameplay yet, along with fun and fresh ways to play modes such as Ultimate Team and Draft Champions, Madden NFL 17 is the most complete Madden ... ever. 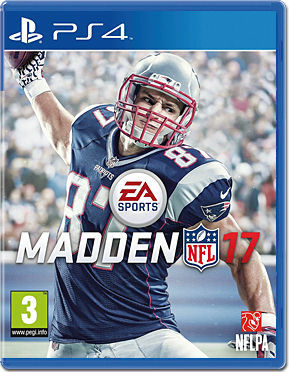 Pre-order your copy today and receive up to $15 in bonus content including nine Madden NFL 17 Ranked tickets and up to seven Madden NFL 17 Ultimate Team Pro Packs. Madden NFL 17 unlocks the fun in the Ground Game, the area of the game most often used on offense, defense or special teams and rounds out your defensive and air game supremacy perfected in past Madden NFL titles. Ball-Carrier Feedback System: New prompts and path assist help identify defensive threats and recommend special moves to elude any defender. Pass & Rush Counters. Simplify play-calling on defense. Ways to Play, Madden Ultimate Team or Draft Champions.